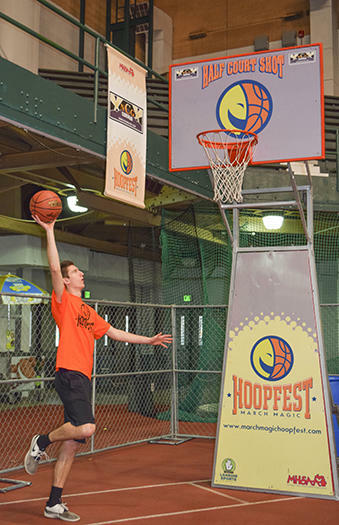 March Magic Hoopfest is a lot of fun! Just like the NBA! This three point challenge tests contestants&apos; long range shooting skills from behind the arc. See if you can sink 12 shots in 30 seconds. Top point totals will be posted each day! Can you dribble and dish the rock like Ervin Magic Johnson? Show your best ball handling skills and bring the magic back to Jenison! Here’s a place for our future stars to play. Stay as long as you want! The only requirement is to have fun! Color this picture of "Hoopie" and bring it to hang up at the March Magic Hoopfest event! Coloring sheets will also be available on-site.